He was a tall, powerful man, and he knew how to work. He could plough from dawn to dark and stack full grain stacks faster than two hired men together. 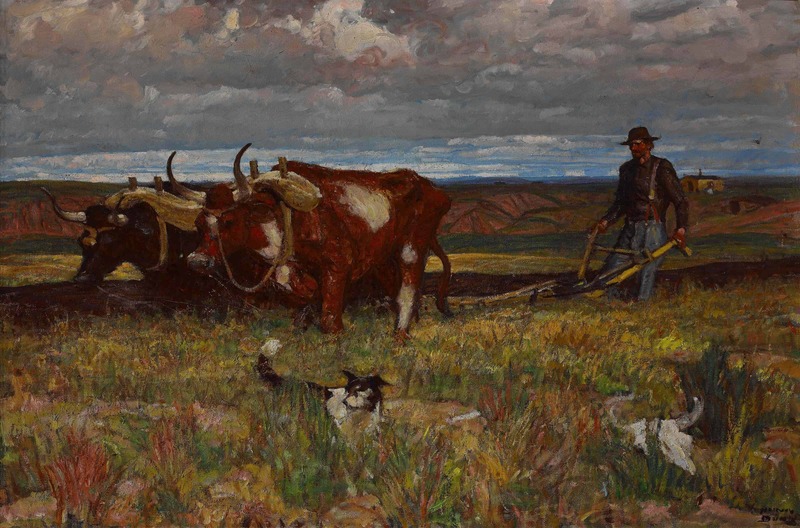 Lynn Verschoor, director of the South Dakota Art Museum, and Jodi Lundgren, curator at the museum, have talked with people who knew artist Harvey Dunn half a century ago. His art students remembered his words long after his classes and even published a book from his talks. “He was the size of a linebacker and spoke of art like Vince Lombardi,” Connecticut artist Dan Howe wrote in the exhibit catalog. Dunn came from the South Dakota prairie to Howard Pyle’s Delaware studio, to New York City publishers and the hell of the trenches in World War I. The Norman Rockwell Museum in Stockbridge and the South Dakota Art Museum have joined to show the arc of his life in a new exhibit of his artwork and his students’ work, opening Saturday, Nov. 7. Dunn was one of Norman Rockwell’s inspirations, said Stephanie Plunkett, chief curator at the Norman Rockwell Museum. Dunn was a powerful and masterful painter, and as a teacher he touched the lives of many of his students. 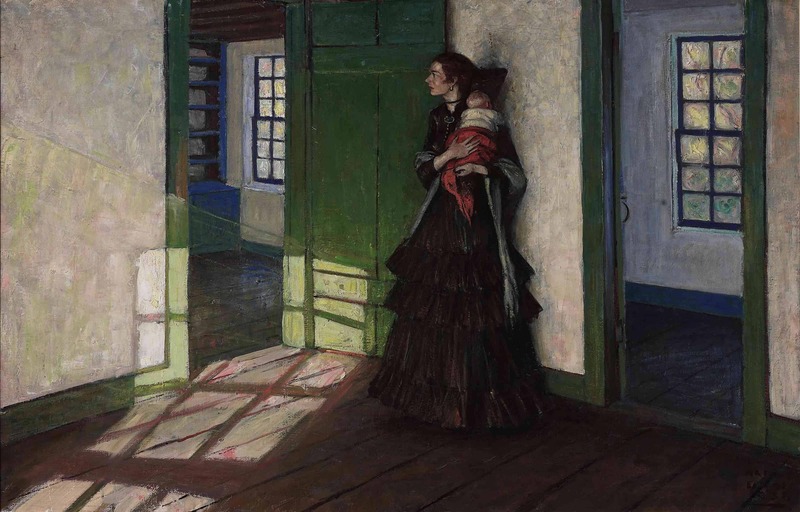 His own early teacher, Ada Caldwell, encouraged him to follow his talent to the Chicago Art Institute, where she had studied, and where he met artist and illustrator Howard Pyle. On the Brandywine River in Delaware, Pyle had a growing school of students — and his ideas of painting and composition were turning the art of illustration upside down. He and his students led an American style of painting and illustrating widely different from the established British school, Lundgren said. The British illustrations had the theatrical and distant quality of figures moving on a stage or screen. The new American school felt more lifelike in its angles and spaces and gave a dramatic feeling of being present in the image. In Delaware, Dunn studied with artists who would become nationally known figures and his friends; when he married Johanna Krebs in 1908, N.C. Wyeth was his best man. Pyle set his students to work from the beginning. Imagination could carry Dunn a long way, Lundgren said. He could see the ocean in a field of waving grass He was once assigned to paint for a story set in India, and he had never been there and had no references. When the illustration came out in print, he got letters praising its accuracy, and one writer was certain he knew the place Dunn had visited to paint it. Dunn was vigorous, rough and expressive with paint, she said. He would focus on the essential elements in a scene, on what he needed to capture the spirit, and leave out anything else. Pyle encouraged his students to paint not the climax of a story but the moment before or after it — the silence after the shot is fired can be more powerful than the shot itself. Then came a break. When the U.S. entered World War I in 1917, Dunn joined the American Expeditionary Forces in the trenches. He was living with soldiers on the front lines, drawing and taking notes to show the human experiences — soldiers lying dead in a vineyard or sitting lit by the muzzle flash of artillery fire, a mother and daughter sitting by a bombed-out wall. “He would go over the top with the boys,” Lundgren said, when the soldiers were sent into battle. A cartoon drawn at the time showed him painting with explosions detonating around him and refusing to get out of a general’s way until his sketch was done. He had a reputation for independence. “He worked on his own,” Plunkett agreed, so much so that his government sponsors often found his sketches too real. They wanted heroic images for propaganda posters. Dunn hoped to develop these studies into paintings, she said. But when the war ended, the project lost funding. He later painted from his sketches for magazine covers. But he came home changed, and he took up his old work slowly. He began to return home to South Dakota at least once a year to visit his sister, Carolyn, on her farm. That connection to the land was essential for him after the war, Lundgren said. It was a healing place. 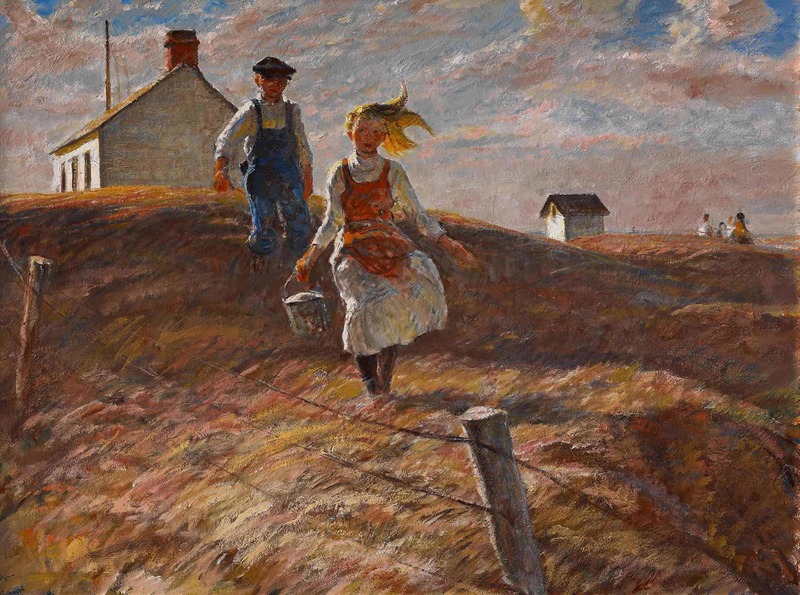 He began to paint prairie scenes, weather and landscape, school days. He painted strong, central, grounded women, Verschoor and Lundgren said — women stretching wire fences, working in the fields in their kitchen aprons, hauling a cow home for the twilight milking. In New York, Dunn went on to teach at the Grand Central School of Art, which grew to become one of the largest art schools in the city. John Singer Sargent, Edmund Greacen, Walter Leighton Clark founded the school above Grand Central Terminal in 1922, Daniel Chester French became a co-director. The school ran and Dunn taught there for more than 20 years and closed in 1944, in the middle of World War II.